Here's my favorite movie of the year so far. Look, I understand that calling something my 'favorite so far' is a meaningless statement, seeing as it's not yet March and we still have a lot more 2014 to go. But Cheap Thrills is a movie without big stars getting a very limited theatrical release. Despite the major festival buzz its been riding for about a year now, there's a good chance it's going to slip through the cracks, and it shouldn't. If being hyperbolic and reactionary gets your attention and convinces you to check it out, we all win. So I stand by my statement. It's my favorite movie of the year so far. Even if a movie is released in the coming months that I like more -- Blended hasn't hit theaters yet, so you never know -- it's going to be hard pressed to boast a better ensemble than this one. Essentially a four-person black comedy, Cheap Thrills gets brilliant performances from two actors you might not yet be familiar with and two you know but will totally surprise you. There was a horror film that came out last year called Would You Rather with a similar premise to this one: a group of strangers get together at a house while a rich man gives them huge sums of money to do terrible things. While that movie had a lot of things to like -- chief among them a great performance by Jeffrey Combs -- it didn't quite know what it wanted to say and failed to build on itself in a satisfying way. Cheap Thrills fixes those problems. It's also not a horror movie. It's a dark, dark comedy with much more on its mind than just what the title implies. It's a movie about the increasing income gap in America. About how the 99% squirms under the boot of the 1%, backed into doing whatever they must to pick up the crumbs. About the desperation that results from these difficult financial times. About how men can be turned into monsters by the All Ighty Ollar. It's not overtly political -- you can still enjoy the movie even if you're on the side of the 1% -- but I like that it's there, as all of my favorite genre movies sneak in commentary under the guise of being little more than niche entertainment. There aren't a ton of surprises in store; once we understand the premise of the film and recognize that the stakes will keep getting raised, we can see where the movie is going. Cheap Thrills is good enough that it doesn't matter. Even if the movie wasn't great -- and it is -- I would probably love it just for reuniting Pat Healy and Sara Paxton, the two stars of Ti West's terrific 2012 ghost story The Innkeepers, still one of my favorite horror movies of the 2000s. Think about big movie stars in a similar situation. Richard Gere and Julia Roberts make Pretty Woman together and then they make Runaway Bride together and they're placing the EXACT SAME people. Doesn't matter that the characters' backgrounds are different, or that the relationship between the two has a completely different context. They're still Richard Gere and Julia Roberts. Same goes for the (slightly) more platonic pairing of Owen Wilson and Vince Vaughn. Now consider Healy and Paxton. There are no traces of their Innkeepers performances in Cheap Thrills. They create brand new people with brand new histories and a brand new relationship to one another. THAT IS ACTING. I like big Hollywood movies as much as the next your aunt or uncle, but there's a reason I gravitate to cool little genre movies like this one. It's where the more interesting stuff is happening right now. Paxton, so funny and adorably human in The Innkeepers, is essentially playing Paris Hilton here: spoiled, dead inside, never engaging with the real world when she can just observe it blankly through her cell phone. Hers is a performance built mostly on reactions, but pay close attention to her during a few specific moments and you'll realize just how clever her work is. She's a knockout. Healy, graduating from supporting character roles to leading man, is miles away from the sarcasm and irony he laid on so thick in Ti West's movie (and even further away from the evil creep he literally phoned in for Compliance). Craig is an exceedingly normal family guy, but I love how Healy slowly reveals that his decency and good guy exterior hides traces of darkness in his past. What he does he does for the "right" reasons, but the fact that he's able to do them at all tells us something about who Craig is but does not say. And then there's Ethan Embry, who had a run as the teen movie goofball of choice in the mid-'90s in movies like Empire Records, That Thing You Do! and Can't Hardly Wait (a movie he now claims to not remember making). He's worked consistently throughout the 2000s, but I haven't seen him in much (he's done a ton of TV), making his appearance here a completely pleasant surprise. The goofy mannerisms have been stripped away; Embry feels more confident and mature. We can see that Vince has been a bit of a fuckup in the past -- Embry's own filmography actually contributes to that -- but he also feels genuinely dangerous. He disappears inside the character, giving what is easily his best performance to date. 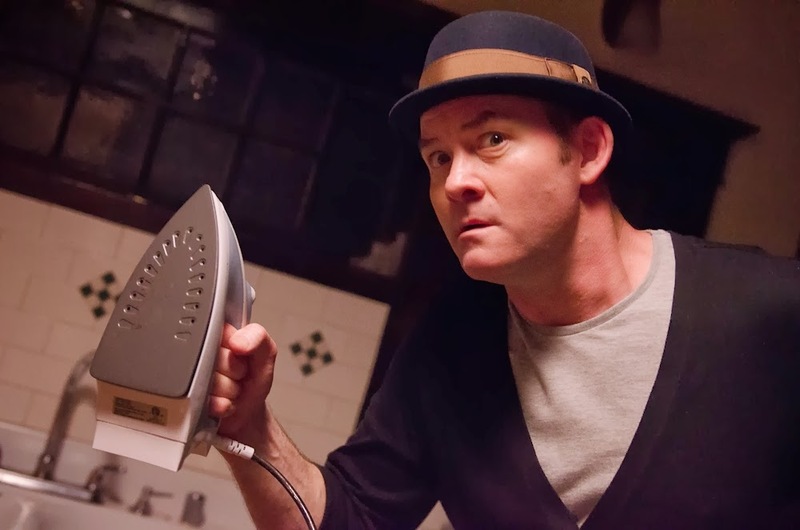 But the real MVP of the movie is David Koechner. This is a guy who was fired from Saturday Night Live after just one season in the late '90s and who has spent roughly 15 years since showing up in movie after movie just to constantly remind you what a funny actor and big character he is. Koechner is always a bright spot in whatever he appears; as an audience, we tend to breathe a sigh of relief when he's on screen because we know he can be counted on to do something interesting or funny whether it's in big mainstream movies like Anchorman or smaller genre ones like Final Destination 5 and Piranha 3DD (barf). Nothing he's done in the past can compare to how fantastic he is in Cheap Thrills. It's a movie that capitalizes on everything great about him as a performer: he's funny, but in a way that feels "off." Cheap Thrills is the first movie I've seen that understands his off-ness is masking something dark. The movie is co-written by Trent Haaga, star of Troma's Terror Firmer and co-writer of Citizen Toxie: The Toxic Avenger IV. Between this and the fact that James Gunn has Guardians of the Galaxy coming out this summer, it's pretty exciting to see Troma taking over Hollywood. It means that a childhood spent watching USA Up All Night can now be considered "background research" and not "wasting my life." Seriously, though, it's great to see hard work and creativity rewarded with success. There's a reason Lloyd Kaufman has been around as long as he has. He can spot talent. Haaga and Gunn are proof of that. I've reviewed several genre movies getting limited theatrical and VOD releases this week, all varying in quality and in what they're able to accomplish within their respective genres for their respective budgets. Knights of Badassdom is a movie that could have been terrific, but was fucked out of a chance by behind-the-scenes post-production nightmares. Almost Human is fun but stops just short of being an exercise. Cheap Thrills is the only one of the three that gets everything right, offering great, memorable characters, smart writing and taut direction by screenwriter-turned-first-time-director E.L. Katz (he wrote Home Sick, Adam Wingard's first feature). Katz knows how to build momentum -- when the gags need to top one another, when to go too far and when to pull back and, best of all, when to turn really, really dark. 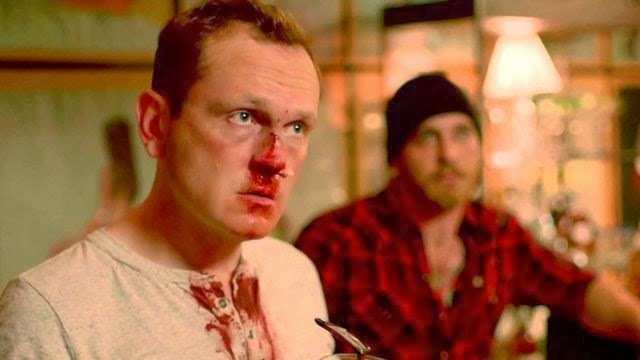 Cheap Thrills is a bruised, bloody comedy with ideas behind it. With its tonal high wire act and nary a wasted minute, Katz and company show us exactly how to make this kind of movie. You don't need a ton of resources, you don't need shock value or gore (though there's one moment that inspired my biggest wince in a long time). You need good writing, good characters and good actors to bring them to life. Boy, does Cheap Thrills have that. And two guys pooping on a floor. 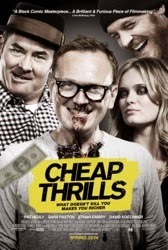 Cheap Thrills hits theaters March 24th, 2014. It is currently available on VOD. Lot of people who's work I've liked and the return of the Paxton/Healy pairing? (Plus,l no dead guy in a bathtub? Hopefully...) Sold! You had me at "two guys pooping on a floor." I had such a great time seeing this at a theater last night. If you intend on seeing the film, try to avoid the trailer. It doesn't spoil much, but I would have liked to have gone into the film knowing none of the bets that take place throughout it. Even one of the posters reveals a major bet that takes place in the film. The same happened before when I saw Dale and Tucker VS. Evil's trailer, but still ended up enjoying the film a ton. That's awesome that you got to see it in a theater. Glad you dug it.